Travel to Iceland and Stay Safely Gluten Free! We're a decade into the growth of the gluten free "marketplace," thanks to increased awareness of Celiac Disease and gluten sensitivity -- and improving rates of diagnosis. Not only has "gluten free" become a household term, in many cases it's become a dietary "trend." For those of us personally affected by Celiac or gluten sensitivity, this is a mixed blessing -- as many have discussed in recent years. While demand for gluten free meals in restaurants eventually gives us more choice, the situation does come with pitfalls. First and foremost is the need to ensure that any restaurant with a gluten free menu knows not just what ingredients are used in their recipes...but how to safely prepare the meal without putting you at risk from gluten cross contamination. Don't get me wrong...I do appreciate restaurants that make any effort, especially if their main focus is keeping Celiac and gluten sensitive diners safe (i.e. educating themselves on reducing the chances of cross contamination in the kitchen). But sometimes that's where the effort ends. Too many times recently, we have dined at restaurants -- or even at high-end resorts -- where it was clear no one with Celiac was helping them develop and taste-test their gluten free offerings. The result? Major disappointment and that feeling of being denied the same dining experience as others at the table. That's an especially sensitive matter when dealing with a child, like our own 13-year-old son. Despite efforts at due diligence, you're still sometimes left feeling like you made a bad restaurant choice. It's really rather surprising that, after a decade of rising awareness and a growing gluten free community, chefs wouldn't be taking this more seriously. After all, if there's just one GF person in a group -- be it friends, family, or co-workers -- guess who's making the decision where to dine? The smart restaurants (and hotels/resorts) understand that attention to this growing segment of the population -- a "trend" that's not going away -- is good business. It brings in not just that one diner, but whole groups of people...and often on a repeated basis. 1.) Being "out of" simple things like gluten free hamburger buns or bread. This has happened to us twice in just a week. After calling and/or researching a restaurant or resort ahead of time, we placed an order for a burger only to find out that they "ran out of" gluten free buns or "didn't have them today." Really? This is not a hard thing to keep in stock. When you are nearing the end of the batch, order more. Gluten free bread products can either be made in house or purchased at virtually any decent grocery store...and then kept in the freezer so they don't go bad. Careful defrosting and warming of the bun allows you to deliver a true "burger" experience to all your customers, rather than making your GF guests eat the burger with a fork and knife or wrapped in lettuce. 2.) When a restaurant clearly doesn't taste-test the GF offerings to see if they're edible. This happens quite often...you're told a place offers gluten free bread, rolls, or muffins, for example...but it would be better if they didn't. They're so awful-tasting that you'd rather go without. The best example of this for us came when taking a cruise a year and a half ago at Christmas. Although the cruise line delivered an overall good gluten free experience, we special ordered gluten free muffins one morning...only to take one bite and no more! Clearly, no chef on board had bothered to taste the crumbly, salty, tasteless muffins...or they would have been embarrassed to serve them. They were just awful, which made me so sad and upset for our Celiac son, especially since it was Christmas morning. 3.) Taking the easy (and lazy) way out. If it's too much for your kitchen to handle making various allergy-free and gluten free variations of items to keep on hand, it would be much better to just buy top brands available in a good store and keep them in the freezer to serve as needed. There is no shame in this. There are plenty of amazing store bought cookies, brownies, cupcakes, muffins, pizza crusts, rolls, and breads available...you just need to do a bit of taste-testing until you find what you think are the highest-quality products. 4.) Trying (and failing) to do-it-yourself. Building on #3 above, unless you pride yourself on being a 100% dedicated gluten free restaurant or bakery that has spent months -- or years -- perfecting the art of gluten free baking, we don't expect you to make everything from scratch! In addition to buying store-bought products, purchasing gluten free mixes is another easy option. Chances are, your chef, no matter how good, will probably not be able to beat the taste of a good gluten free cake mix by, say, Betty Crocker, who spent years perfecting their gluten free line in their test kitchens! So take advantage of their trial-and-error. Keep a box or two of their cake mixes, brownie mixes, and chocolate chip cookie mixes on hand. You can make them according to the directions or experiment with ways to use the cake mix, for example, as a base for a coffee cake recipe. Tons of recipes are available online for using store-bought mixes. 5.) Using mixes or flours that omit every single possible allergen. For diners who need to avoid multiple allergens, these products can be a God-send. However, they're typically not the tastiest, unless you get an experienced baker who knows how to tailor them to ensure a proper consistency and taste. For the average chef, however, using these products (often primarily rice flour) results in a flavorless product like the tasteless muffins I referenced above. Therefore, for your average gluten free diner, using a mix or buying a product that's gluten free (but not necessarily dairy-free, soy-free, egg-free, corn-free) will result in the best taste. 6.) Not properly heating or reheating items like rolls, bread, and tortillas. This is a simple thing, but almost universally messed up by most restaurants. Serving a store-bought gluten free hamburger bun straight out of the bag is NOT the way to do it. Depending on the brand, you can toast it, wrap it in tin foil and heat it in the oven, or even briefly microwave it to soften it and/or bring out its flavor. I can't think of many -- or any -- gluten free buns I've had that were best straight out of the bag. Same goes for breakfast sandwiches (like the one I made below)...find a good gluten free roll or English muffin to use as a base -- and heat it properly to bring out the flavor. Ditto for corn tortillas...these need to be warmed (preferably in a pan with a little oil, as opposed to microwaved) and doubled-up to prevent the tortillas from cracking and dropping the sloppy contents all over your plate. 7.) Removing all offensive (gluten-containing) items instead of making an effort to find a gluten free substitute. An example of this is offering a Caesar salad without the croutons or dressing. Come on, chefs...there are gluten free croutons available at stores, or you can easily make your own by toasting and drying gluten free bread. Another option is to use the new baked cheese "croutons" now available in stores (sold in resealable pouches that keep them fresh for a good while). And again, there are plenty of store bought salad dressings that are gluten free...if you don't want to adapt your own recipes to make them gluten free. You can even do what Burtons Grill does...find ways to make more things gluten free so everyone can enjoy them. They even use a good gluten free flour mixture to dust their fried items, like this amazing gluten free calamari, shown below. 8.) Eliminating choices which could easily be made gluten free with a few simple substitutions. Top of mind here are things like crab cakes. Most recipes require at least a small amount of bread crumbs to help hold the crab together. Fine. But why not purchase (or make) gluten free breadcrumbs to use in all your crab cakes? This small change is undetectable to any diner yet opens up another wonderful choice to your gluten free clientele. Same goes for lasagne. We make a killer deep-dish lasagna here at home following our favorite back-of-the-box recipe to a "T"...but just substituting the "regular" lasagna noodles with gluten free lasagna noodles. 10.) Lastly, and most importantly...and more than just a pet peeve...is when restaurants claim to offer gluten free meals but don't give any thought to keeping it from coming into contact with sources of gluten. This is a training issue and needs to include everyone in the kitchen, as well as the "front of restaurant" staff of servers and managers. Too many restaurants offer fries on their "Gluten Free" Menus, but if you inquire further, you often learn they are fried in the same fryer as the breaded (gluten-containing) chicken nuggets or onion rings. Newsflash: the fries are therefore not gluten free. Same thing with pizza. As Domino's found out years ago when they launched their "gluten free" pizza, gluten free ingredients does not a gluten free pizza make! If it's prepped on the same prep surface and comes into contact with flour from the regular pizzas...or is cooked on the same oven surface as other pizzas (not protected in a pan)...or is cut with the same pizza cutter...it is not gluten free. A third common mistake is to cook gluten free pasta in the same pot of water where regular pasta has been cooked -- or to use the same colander or serving spoon. All restaurants promoting items as "gluten free" owe it to themselves -- and their customers on medically-necessary gluten free diets -- to thoroughly educate themselves before rolling out a gluten free menu. When done right, gluten free meals offered at restaurants can be safe, flavorful, and just as good -- if not better -- than their gluten-full counterparts. One only has to look as far as some of the restaurant chains that were early to serve this market as evidence that taking gluten free customers' needs and tastes seriously results in a big boost in business. Great examples include Bonefish, Biaggi's, Burtons Grill, Legal Seafoods, P.F. 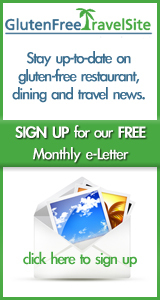 Chang's, Picazzo's, Travinia, and Wildfire, which are all showcased on our Gluten Free Restaurant Menus page. Did I miss any of your pet peeves? Any other examples of mistakes restaurants make when trying to offer gluten free alternatives? Please share your comments and your own experiences below. Better yet, share feedback on your favorite restaurants -- chain or independent -- by submitting a review to our website, GlutenFreeTravelSite, the first website to give people a place to review restaurants, bakeries, hotels, resorts, B&Bs, and cruises (all over the world) -- as far back as 9 years ago! We look forward to continuing to provide users with a place to search for the best GF-friendly restaurants and vacation destinations for years to come! Thanks for your support!